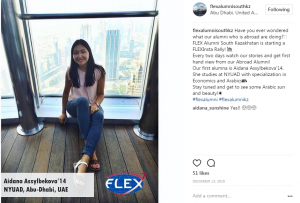 After spending an exchange year in the U.S., FLEX alumni are oftentimes open to new opportunities including applying for other exchange programs and study abroad opportunities. 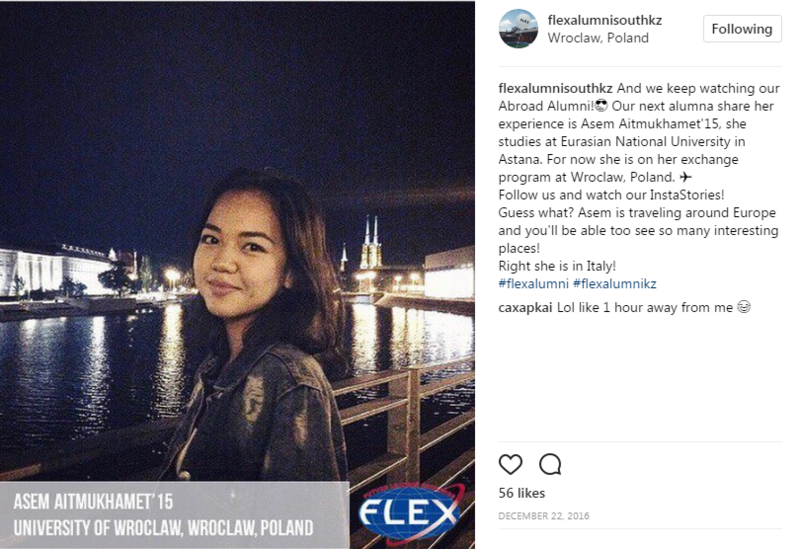 For most alumni, the FLEX program was their first exchange experience and first travel outside of the country. And many strive to make sure that it is not their last! Alumni from Southern Kazakhstan who are currently participating in other exchange programs and studying outside of the country organized an event to highlight what opportunities are out there through the Alumni Abroad Social Media campaign. 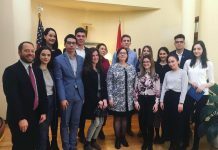 Alumni shared stories about their exchange experience and answered alumni’s questions about the admissions process and life in the country of their exchange via posts on Facebook and Instagram. Fun Fact: South Korea is the #1 study abroad destination for FLEX alumni in Kazakhstan and many attend Hankuk University of Foreign Studies (HUFS), a private research university based in Seoul. Aydana Asylbekova ’14 (Semey, Kazakhstan/ Grand Forks, ND) studies at NYUAD with specialization in Economics and Arabic language. 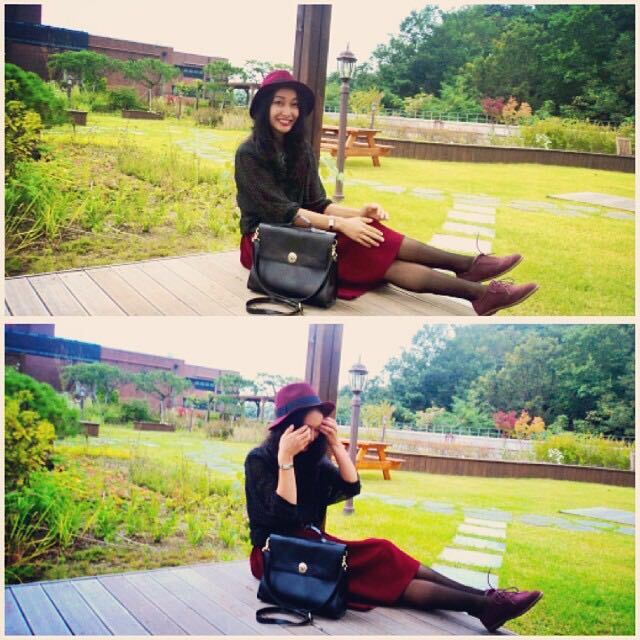 “At first, I was amused by the number of foreign students who were studying at NYUAD. 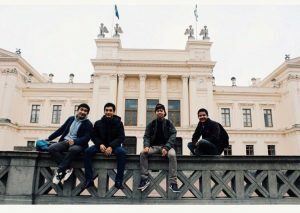 I learned quickly that this diverse student body makes studying there even more deeply enriching, because you get to learn new things from other cultures and other people’s perspectives, which might be very different from the ones you ever encountered before!” NYUAD includes students from over 100 nations. Fun Fact: Many FLEX alumni are students at NYUAD, in fact, five alumni were part of the first graduating class of NYUAD in 2016. Yerassyl Toleugazinov ’12 (Semey, Kazakhstan/ Lacey , WA), through the Erasmus Mundus exchange program studied at Lund. His impression of the year included the following, “The year I spent in Sweden was amazing, but it wouldn’t have happened without the FLEX exchange year in my life. 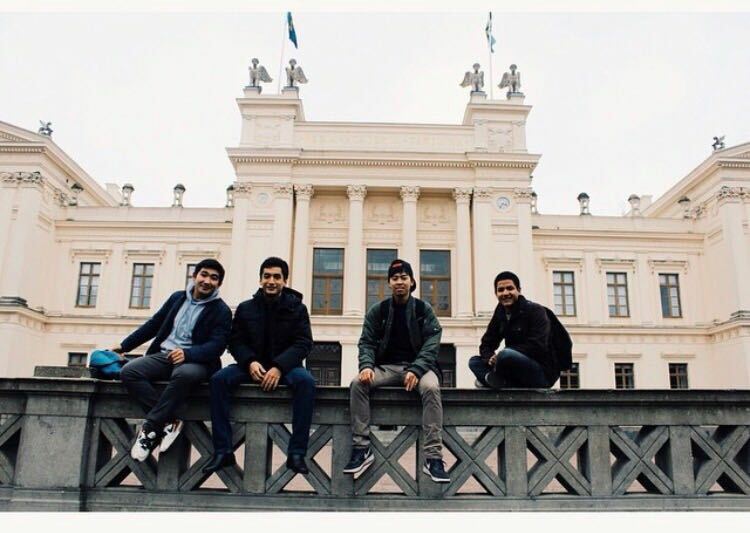 FLEX has prepared me and other alumni to be even more flexible and adaptive in other cultures.” Lund University is one of Europe’s oldest, largest, and most prestigious universities, consistently ranking among the world’s top 100 universities. Fun Fact: Alumni and faculty of Lund University are associated with, among other things, the development of the Bluetooth technology. 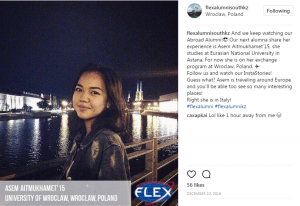 Asem Aytmukhamet ’15 (Pavlodar, Kazakhstan/ Woodland Park, CO), a student at the Eurasian National University in Astana is spending an exchange year at University of Wroclaw in Wroclaw, Poland. Her favorite part of being in the heart of Europe? Travel! Asem has taken the opportunity to travel around Europe and see many interesting places! When the Social Media campaign was running, she posted her story from Italy! 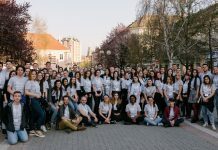 Fun Fact: The University of Wroclaw produced nine Nobel Prize winners in the 20th century – will we have a 10th and among the FLEX Alumni community?! These were among the many highlights that alumni shared through the campaign. To round out the event, FLEX Alumni Coordinator for Southern Kazakhstan Yenlik Bbeketayeva ’11 (Talgar, Kazakhstan/ Houston, TX) will work with representatives of Education USA in Kazakhstan to share information with FLEX alumni and its network on social media about opportunities, scholarships, and admissions to U.S.-based universities and institutes of higher learning. 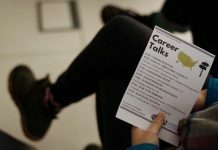 FLEX alumni are eager to develop and take on new challenges. 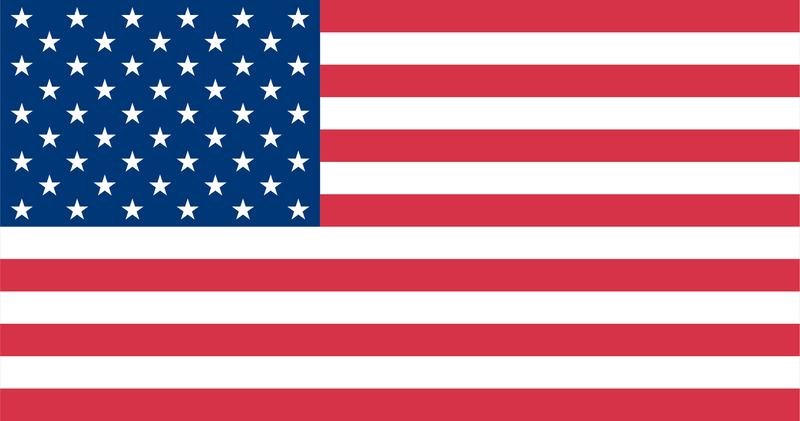 If you, alumni, would like to share information about a university, scholarship, or program that you would recommend to others in the FLEX alumni community, contact the FLEX Alumni program at flexalumni@americancouncils.org about your suggestion and we will share it with the alumni community through the FLEX Alumni website.